First of all, I need to express how much I love this look. A long sleeve maxi with a high waist and a laid back vibe? Just perfect. 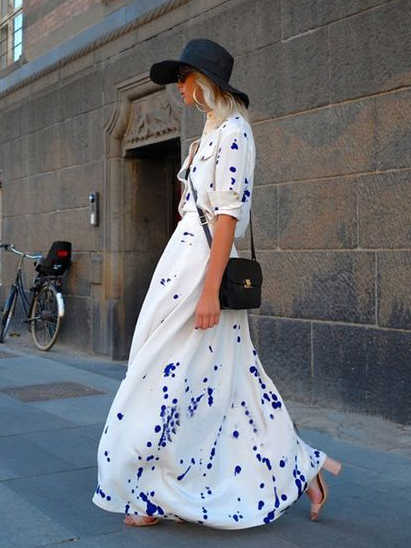 The heeled sandals, bag, and floppy hat are also really working for me. Secondly, and perhaps most important, this dress is $54. I don't own it (yet), so I can't speak to the fit, but for $54 it's worth putting right in your online cart and bringing it home. p.s. Since I haven't started any Holiday shopping, I'm going throw together a last minute gift guide or two. Stand by for a few upcoming gift ideas for those of us who prefer to shine under the pressure of last minute gift giving. Just like a diamond, right? Oh my goodness I loooooove this dress. You need it. Wear in Florida. Go.